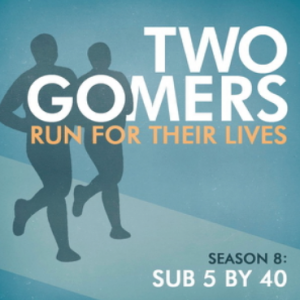 Season 3 : Episode 2 – The Gomer Curse? Now that the Gomers are fully into their 3rd season, guess what? There’s more distractions, injuries, and weird sicknesses than you can shake a bassoon at. But that’s not stopping them – in fact, they’ve both been having pretty great weeks – not counting the blood in the urine, of course. Didn't want to post a picture of Runner's Hematuria, so here's a picture of a puppy instead. Plus all your favorite sections: Week in Review, Listener Feedback, a new Monday Survey, and two new Songs to Run To…AND a brand new section, Gomer Gear! Men, need a product that will keep EVERYTHING warm in the bitter cold while running? You may want to take a listen. Hope you like the episode, Happy Running! This week’s Monday Survey: What are you most thankful for when it comes to your running journey? Dude, if you haven’t already, go to a urologist!!! From personal experience I’m telling you, runners can get kidney stones and cancer too – blood in the urine should never be assumed away.